It’s more than a friendly rivalry but less than an all-out war. For decades, teams in both the U.S. and the United Kingdom have taken the international Land Speed Record very seriously, and for the last 15 years, the trophy has sat with the Brits. The battle is heating up again. In this class, the cars are jet or rocket propelled—they are essentially aircraft without lifting wings. 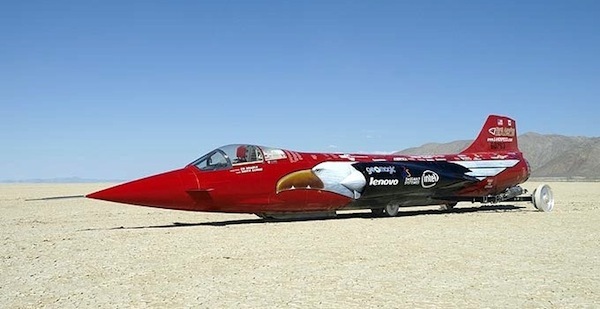 The current land speed record was set in 1997 by Englishman Andy Green in the ThrustSSC. He cranked off a 763.035 mph flying mile to become the first wheeled vehicle to go transonic or “break the sound barrier,” generally stated as 745 mph at sea level. Of course, others think they can break that record. The North American Eagle team, based in Washington state, is preparing for its first high-speed test runs after years of development. The underfunded and lightly sponsored team says their 56-foot, 12-ton jet car should be able to top 800 mph when the testing and tweaking is complete. The Brits are taking a dim view of possibly losing the record and continue preparing another attempt of their own. The Bloodhound SSC (supersonic car) team recently tested its rocket propulsion system which provided 14,000 lbs of thrust. When that’s coupled to the Cosworth V-8 engine (borrowed from Formula One race cars), the team predicts their car will exceed 1,000 mph or roughly Mach 1.3. Many military aircraft that cannot achieve that speed. The development programs for both cars are very similar to those used to build high performance aircraft and are exploring new territory including the effects of transonic speeds on a ground based vehicle. Neither team has announced any schedule for attempting the actual record runs. And just as this was closing for posting, news came in that Lola Cars International in the U.K has been closed. The company had filed bankruptcy in Spring of this year, but fully expected to find a buyer and get back to business. A buyer never appeared and the company has ceased manufacture of its various high-tech competition cars. Except for drag racing, NASCAR, ( and the land speed record), it would be difficult to name a class or international race series for which the company did not build a car during its 55 year history. Lola’s successes at Indianapolis, LeMans, Formula One events and in other high profile races around the world is legendary. Many of their most famous race cars are on display in museums throughout the world. This entry was posted in Automotive, Automotive training, Mobile Air Conditioning and tagged #air conditioning, #fast, #MACS Member, #Macs worldwide, #racing, car, car care news. Bookmark the permalink.